Alison Bullock and I had planned to record a reflection on Learning with Hyperdocs this month. We decided to capitalize on the amazing Banff scenery while attending the CNIE2017 conference, to record the reflection. At this point in my life I find myself with one university graduate and one in first year and on the way. It has certainly been a long time since I attended an elementary school meet the teacher night. In a recent summer conversation with WRDSB teacher Alison Bullock, my interest in the parent aspect of school year startup was rekindled. Alison was enthusiastically sharing about her plans to provide parents attending with a fast paced “tech slam” – a quick tour through many of the different online services students would be using in their learning journey with her. I approached Alison about attending meet the teacher night, and I was thrilled that she readily agreed. On parent night evening, I arrived at portable 4 to find an energized room of parents and students. Students were eagerly leading parents to their seating area. 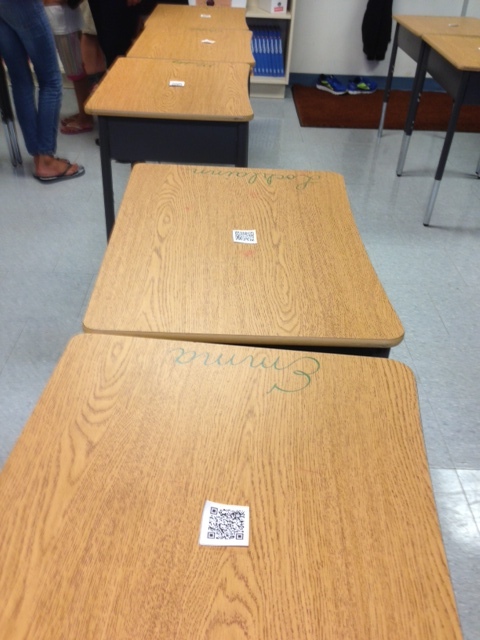 On the top of each desk was a QR Code that linked to a personalized welcome video for each parent. Students were visibly excited to show their parent(s) how to access the video and have them watch it. Now it was time for the tech slam. Wow – actioned packed, filled with key learning statements and clearly highlighted the connected learner robust technology enabled approach to be used in the classroom. Casual conversation with parents afterwords showed excitement and interest about the approach to learning their child would participate in. If I had elementary school aged children, this is the type of classroom learning experience I would want them to have. Follow Alison’s class on Twitter: ESTP4.